Salcha is a small rural community located 32 south of Fairbanks, and just a few miles south of Eielson Air Force Base. Salcha is named for the Salcha River that meanders through the area. 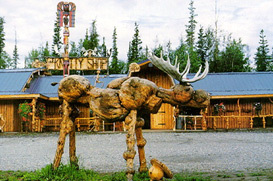 The community of Salcha has an elementary school, and is home to the famous Knotty Shop and SeeMore, the Knotty Moose. And while it’s a loose knit community, the local residents come together once a year for the Salcha Fair, a fun-filled day of music an events like none other in the State. If rural Alaska living is your thing, make the Salcha area your home! We have a team of buyer specialists that can help you buy a new home in the Salcha area. And, if you are selling a home in Salcha, Madden Real Estate can guide you through the entire process with a customized marketing plan. We offer free home buying tools that will give you the information you need to successfully buy Salcha area real estate. And our buyer specialists are experts in guiding you through the myriad of Salcha homes for sale until you find the perfect property for you and your family. If you are interested in Salcha foreclosures, Salcha REOs, and Salcha bank-owned properties, you can find them through the Madden Team. Our Salcha real estate agents and Salcha Realtors provide professional service that is hard to beat, and our team has connections to help you find home loans and mortgage information that will fit your needs. The Salcha real estate market is competitive, and you will want our team of real estate specialists on your side.